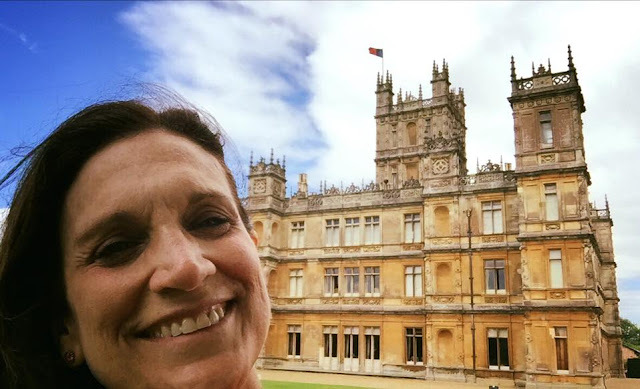 Travelogue: Day 11 - Birthday at Highclere and Jane Austen's House! My birthday! After breakfast, we checked out promptly at 10 am. We had originally booked our tickets for 1 pm entry into the Castle thinking we could hike Beacon Hill and Watership Down and the grounds around Highclere before our entry. Since we had already done Beacon Hill and Watership Down, we asked the nice older gentleman at the ticket booth if we could change our time, and he said, "Sure!" So we walked in 20 minutes before its official opening. The people at each room of Highclere were so willing to answer any question, and there were stills of different scenes that had been shot in that particular room. It was like a dream to walk through these rooms that I have watched since 2011. (When I planned our "dream trip" in 2012, this was one of the destinations!) I loved the rich wood in the library. We had set our alarm for 4:30 am to catch the sunrise and mist on the Avebury Stones, but George went to turn on our camera, and nothing! We had snapped away the night before, went in to shortly recharge before sunset, and went back out and shot a ton more pictures, but there was nothing this morning. We hoped it was just the battery. We had already been leaning toward NOT going to Bath as it was an hour backtrack and not on our "must see" list. (Jane Austen lived there for nine weeks and hated it there.) Also, we did not feel like going back to a busy town with lots of tourists after being in the country and loving it! So, that would give us some time to go to a camera shop in Swindon to troubleshoot the problem. We ate breakfast at 7:30 am, served by the same guy who rented us the cycles. We were out and on the road by 8 am and traveled to Worcester to see the photograph that is part of the King John and the Magna Carta Exhibit. We had a bit of a problem figuring out our first "Pay and Display" parking lot, but a nice lady helped us. We didn't have a ton of coins (Note for travelers by car - make sure you have plenty of coins handy for this and always have your GPS or Google Maps go to the car park nearest your venue. You can never go directly to ANY venue unless it is a super small village. ), but it was enough for a trip to the walk along the River Severn before the cathedral opened. Lovely! Both our computer and our camera broke on Day 10, and I had only journaled on here up through Day 7. I journaled the old fashion way, handwriting in my journal, but I am now typing it in here! Sunday, July 24: Biking the Cotswolds 33 miles! I have dreamed of doing this since 2012 when I contacted Pedal England and Will Cairns. They had an amazing seven day guided bike trip (that I see is not on their itinerary anymore). We thought that seven days, just biking is more than we wanted so we settled for one day and self-guided. I think it was a great choice. We woke up in time to go to breakfast the next morning at 7:30 (since we booked this place in February, it became a bed and breakfast so we are getting a lower price and breakfast to boot). It was a full English Breakfast with yogurt, fruit, toast, cereal, coffee, tea, and orange juice. It is served by the sweetest little older woman. We woke up super early and got to the Oxford Bus Company x90 by 6:30. It was a bit misty but felt great after all those days of blazing sun. The bus was clean, comfortable, had plug-ins and wireless (although it said I had used my limit very early into the trip but did not pursue that). It was great to see the countryside for the first time. The drawback was the two girls that decided to polish their nails in the top of double decker bus without an option to open windows for ventilation. I was sick for about 30 minutes of the trip, but it was still a great trip. We arrived in Oxford by 8:20, stored our luggage at the Backpacker's Hotel, and walked to a place for breakfast. After three days of waking up really early, we slept in until 7:45 am! The jet lag and time change finally caught up with us. Not to mention the 10-12 miles of walking we had done over the last three days! We had planned to go and validate our Golden Tours Hop On Hop Off bus ticket at the main office that was only a five minute walk from our hotel room and on the way to the Tube Station, but we had no time! We quickly got ready and caught the 8:37 Tube to Shakespeare's Globe on the Thames. We got there at 9:15, and the first tour did not start until 9:30. We had just hoped to look at the exhibition before the tour, but that was OK since we did the City Cruise on Wednesday instead of Thursday so we had some "wiggle room"! 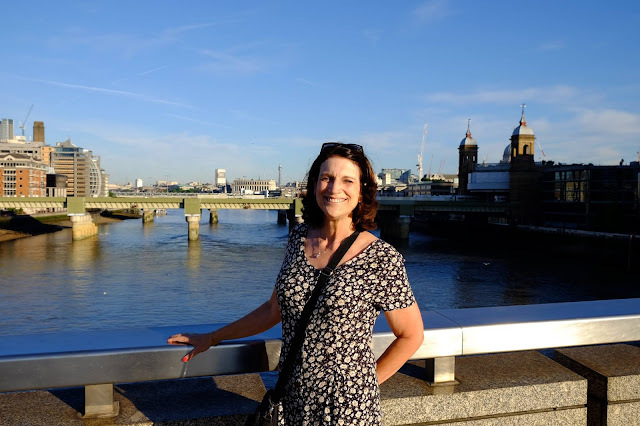 I am so behind in my London Log because we have been busy! I started this while still in London, but now it is July 24th, and I must record before the memories fade! Wednesday was . . .
Two "W" things: Westminster Abbey and Winston (Churchill) War Rooms. I listened to a YouTube video that said that The Regency Cafe was the #1 rated restaurant in London, and it was only a 12 minutes away from our hotel room. We went there on our way to Westminster Abbey, but it was JAMMED packed! It is a little hole in the way, mom and pop type of place with traditional English food. We were sorry to miss it, but we had to get on to our exciting date at the Abbey! I am always so tempted to add pictures to these posts, but they do take forever to load from our good camera because they are big files, but my iPhone pics are quick but not as good quality. I want to review the day and then maybe I will add more photos later when I get back to better internet. Tuesday was about three "T's" in a row: Tower of London, Tower Bridge, and Tate Modern! What a day! Of course, I woke up extra, extra early. I waited for George to wake up, and we were out of the room by 5:15 and on the N16 bus to Abbey Road! How fun to get there via bus. We went by all the Arabic restaurants near Marble Arch, and we met a nice Algerian man visiting on holiday. We got to the road with no traffic! There was the CUTEST little Japanese family of four that was trying to take the picture with the mom setting up the camera on a chair, clicking the self timer, and running over to the road. It did not work! So, OF COURSE, we offered to take their adorable picture of all four crossing the road like the FAB FOUR! We had a seamlessly easy trip across the pond from Portland to Seattle to London. Our first glimpse was of the London Eye along the River Thames. I cried. I have dreamed about going here for so many years that it is really a dream come true.